ETA: Just looking for a yes or no answer on that one. Ugh. God no. My buddy had one and used an old work bench of mine for target practice. I don't know what he was shooting but the BBs from my BB rifle went deeper than his bullets. I'll take a 45/70 though. I was helping my father-in-law sight one in on my property a few summers ago and my shot went through the metal target and grazed the bottom of one of my Cypress trees, taking a chunk of wood out with it, and landed in another Cypress tree. And that was from 150 yards away after blowing through the metal target. I wish I still had the pictures. Funny that Beta doesn't mention anything besides an AR15. where can I get a stinger missile or tactical nuke? Please offer a link. I'd like both. Live over in the middle east. they'll give you both for free. 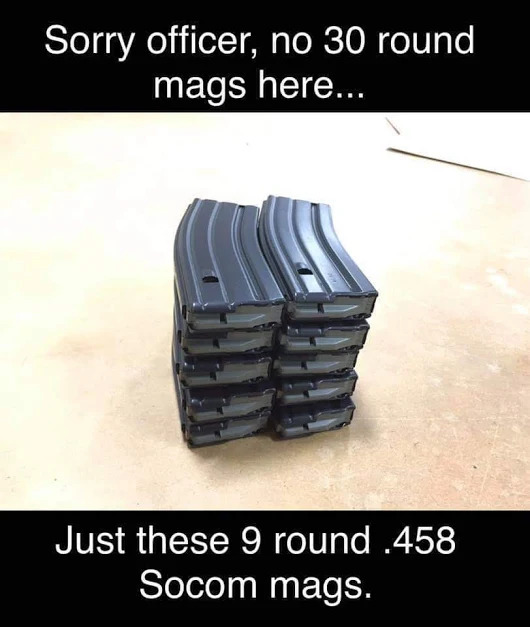 Then lets limit mags to 10 rounds, so people can be less dangerous. Oops they went out and bought the .45 with only 8 bullets and of course the .338 Lapua Magnum mag holds 5 rounds even safer. I suppose you own one and know all about it? I'm sure when it comes time to write a law he will have the right terminology and where fores in place. For the record I know nothing at all about guns or rifles of any kind. zero.... never even touched a gun. Only ever saw one up close once.